Darcy: You’ve written a wonderful array of stories spanning many topics and tones. When it came to writing your first YA contemporary romance WHAT LIGHT, were there any challenges you found that were unique to the romance genre? Jay: When you pick up a romance, you already know two people are going to fall in love. So once you meet the main character, you start wondering about the other person. The challenge with WHAT LIGHT, as opposed to my other books, is that I wanted people to have a strong sense of who Sierra was before Caleb entered her life. To allow readers that time to focus on her as an individual, and not as part of a romantic duo, the first few chapters are mostly Sierra with her best girl friends and her family. Once I introduced boys, it felt like anyone her age with a Y-chromosome was suspect, so I needed to get Caleb in there fast. Darcy: Ah, yes. I’ve never been a fan of the Jerry Maguire you-complete-me trope for this very reason. I prefer to see my characters as individuals, rather than simply extensions of one another, and you absolutely nailed it! Okay, so if you could co-author a book with ANY writer — living or dead — who would it be and why? Jay: I’ve co-authored two books now, THE FUTURE OF US (with Carolyn Mackler) and PIPER (with Jessica Freeburg, releasing October 31), and both experiences were wonderful. It’s so creatively exciting to constantly bounce ideas off someone who shares the very same storytelling goal. But it honestly gives me anxiety to imagine writing with anyone else! Could it actually go that smoothly a third time? So I guess I’ll make my choice based on money and say J.K. Rowling. Darcy: Ha! A very solid financial bet! Now as to the ever-elusive work/life balance — does it exist in your world? If so, what’s your favorite way to unwind? Jay: Nothing beats a dark movie theater and a bunch of buttery popcorn. But if there’s nothing playing I want to see in a theater, we still have a video store in town and I’ll rent a few DVDs. One of our laptops lets you play DVDs at twice the normal speed without the sound cutting out. If the atmosphere isn’t an essential part of the movie, I’ll speed-watch through two movies in the time it normally takes to watch one! Darcy: 1000% with you on movies! Although it never occurred to me to watch them at twice the speed! And while I have legit concerns my brain might melt, I admit, I’m morbidly curious to give it a go. But enough about my impending goo brain, next question! In storytelling, we often reference a character’s black moment, when all hope is lost and the odds seem insurmountable. Did you ever experience a “black moment” within your own writing journey? Jay: A few months before I finished THIRTEEN REASONS WHY, I took my wife to a fancy restaurant to drop the news that I was quitting writing. At that point, I’d been writing and submitting to publishers for twelve years, and I was so exhausted by rejections. But part of me was also just afraid of that specific book getting rejected like everything else. It was the most personal thing I’d written, by far. But my wife started crying because being an author had been my dream since she met me. So I compromised and told her I’d finish that one book and then reevaluate if it didn’t sell. Darcy: To think how close you were to quitting! And your answer is just a swift kick to the feels, because we’ve all been there — beat down and ready to throw in the towel. I adore your wife for being the light you needed in your darkest hour. And I think too often, some people see your success as immediate, so the whole TWELVE YEARS bears repeating. That said, are there any specific books on craft and/or writing organizations that have helped you grow as an author? Jay: SCBWI gave me a great understanding of the industry prior to getting published, mostly through networking and hearing other authors speak about their journeys. I joined RWA when I began focusing on WHAT LIGHT, and that gave me so much inspiration and desire to be a part of this genre. As far as how-to writing books, screenwriting books have been the most impactful for me. They’re all about dialogue and scene construction. Darcy: As you know, I’m so with you on RWA for inspiration! But you also made another excellent point: There’s no singular “silver bullet” group or organization. Sometimes they fulfill different needs based on where you’re at in your journey. And speaking as someone who abhors plotting and finds craft books to be kryptonite, I discovered MY STORY CAN BEAT UP YOUR STORY by Jeffrey Schechert to be invaluable! (And yes, it happens to be a screenwriting book.) But shifting back to your books, I’m so excited for your first graphic novel, co-authored by Jessica Freeburg, PIPER, to release on Halloween! Are there any other projects on the horizon you can share with us? Jay: Jessica and I have since reworked our graphic novel text with an eye toward a theatrical film, and we’ve already had some interest, so we’re excited to see what happens with that. I’m writing another screenplay based on a true story. It’s the first time I’ve written about a real person, and thankfully I have his blessing and support. And, as a bonus, we’ve become great friends! Darcy: That’s so amazing! Crossing our fingers we see PIPER on the big screen (with buttery popcorn in hand), and also for future news of your inspiring screenplay! Thanks again for taking the time to join us, Jay! Now let’s wrap this up with a fast n’ fun Speed Round of questions, shall we? Supersized fries vs. chocolate cake: Supersized fries on a long drive with the windows down and sunglasses on to keep the salt from flying into my eyes. Zip lining vs. snorkeling: Zip lining. I love heights, but have a bit of an open water phobia. Friday night vs. Sunday morning: Sunday morning with newspaper comics and a cup of coffee. Movies vs. documentaries: Documentaries, but I’ve been on an extended kick of watching documentaries about movies. Great interview, Darcy, and great answers, Jay! It’s funny how readers assume that your first published book is the first one you ever wrote. Jay, please thank your wife on behalf of readers everywhere for insisting you finish 13 REASONS WHY before giving up. Thanks for the motivational mojo! I love the questions, Darcy! And Jay had perfect responses for each! I’m so glad you listened to your wife, and I agree that financially, writing with JK Rowling would be excellent. I very much enjoy your works and I can’t wait for more to come! Why thank you, Ashley! And Jay really does have the best responses, doesn’t he? 🙂 Thanks for joining us today! What a wonderful interview, Jay and Darcy. My daughter and I picked up What Light last year in Charleston at YA’LL fest and were one of the last people in line. (We ran across town to make Jay’s signing in time!) It was one of the best books we read all year and has made it to my daughter’s keeper shelf which is a very hard thing to do! What a great interview Darcy and Jay. I have to admit that I’ve never read one of your books, Jay, but as soon as I hit publish on this comment, I’m off to immediately correct that. Fantastic interview, Darcy and Jay! And yes, it’s always good to be reminded that “overnight success” rarely is. Great interview! 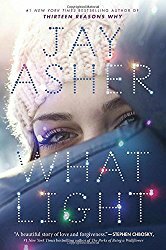 I’d wanted to read What Light, I love the ya genre. Thanks for the chance! Wonderful interview Darcy & Jay – so inspiring, especially the “black moment” – so close to not getting your stories out there!! What a great interview! A dark movie theater and a bunch of buttery popcorn is one of my favorite escapes too. (I love playing hooky to go to the movies, popcorn is great for lunch…shhh, don’t tell anyone!) I read THIRTEEN REASONS WHY when it first came out and have now shared it with my own teen – it’s a really great launching pad for discussion, so glad you did not quit! What a wonderful interview! And I’m so glad your wife convinced you to keep writing!! This is such a delightful interview!! Several of my friends are friends with Jay and I’ve always heard good things, and now I really adore him. 🙂 I’m super intrigued by speed viewing a movie. Oh, my. I can’t believe he almost gave up writing. Thank you for the wonderful interview, Darcy and Jay! Except, chocolate cake in a heartbeat. Fun and informative interview! Loved it. I’ve given up writing several times now, but it always seems to pull me back in. I’m not sure you would have been able to quit either, Jay. It’s great that you have support at home and someone who knows that you needed to be a writer. Thanks for the great questions, Darcy! Great interview, Darcy. 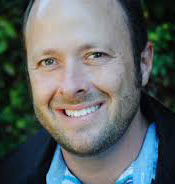 So nice to get to know Jay Asher a little better. Hope the new release goes well! This was such an interesting interview to read! I’ve read Thirteen Reasons Why, and have both The Future of Us and What Light on my TBR. I haven’t heard of Piper though, so will definitely be looking that one up before release! Thanks for the great interview (and giveaway)! Awesome interview, Darcy and Jay! Thanks for sharing your stories with us, Jay! What a terrific interview, Darcy! Thanks to you and Jay for letting us be flies on your wall. Awesome and inspiring interview:) I loved 13 Reasons Why and can’t wait to check out What Light. Coincidentally, I also went 12 years between submitting my first book to a publisher and finally being offered a contract. Yay for perseverance! Great interview! I’ve read 13 REASONS and THE FUTURE OF US. Would love to get my hands on WHAT LIGHT next! It’s so hard to believe Jay spent 12 years facing rejections when he’s so talented. I find that equally inspiring and discouraging – haha!